Wave Alchemy’s Revolution breathes new life into a pantheon of classic drum machines. Revolution is a Kontakt Player-based drum machine plug-in that promises to faithfully capture and reproduce the 14 great and classic drum machines that continue to be essential ingredients in music production. Given that most of us already have access to various sample sets and emulations of at least some of these, Wave Alchemy need to be offering something pretty special. And Revolution does not disappoint. There’s a rich feature-set, including a highly usable internal sequencer. You can create your own drum machine from the palette of modules, which includes all Roland X0Xs, CR78 and 8000, Linndrum, E-mu Drumulator, Sequential Drumtraks and Oberheim DX. Most of all, an epic approach to sampling (over 40,000 samples!) captures every sound at multiple settings and through various signal paths. Revolution proved a little fiddly to get up and running as it’s delivered as four RAR archive files, and Mac users will need to find a suitable extractor on the App Store. The resulting folder can be dropped to your location of choice, then imported and authorised from within Kontakt/Kontakt Player. WA are hoping to package Revolution into an automatic installer at some point. As well as adding itself to your Kontakt instrument list, Revolution also installs as Native Instruments’ NKS patches and so appears as an instrument in your Maschine or Komplete Kontrol library if you have them. Patches are also provided for extra integration with Logic and Ableton. Inside Kontakt, Revolution presents itself as two instruments: Revolution Drums and Revolution Percussion. If you’re in a Komplete Kontrol or Maschine environment you’ll see all of Revolution’s presets with a top-level Type tag to distinguish between the two instrument variations. Essentially these are both the same device but with some different module selection options. The inviting user interface is easy to understand as it follows typical drum machine/groovebox conventions. Fourteen drum mix channels occupy the top half of the panel, and 16 Roland-style gate sequence buttons run along the bottom. The middle area focuses on the selected drum channel, each of which has its own panel based on the original drum machine it’s sampled from. Within the presets, the Drum Machine folder gives you instant access to all the original instruments, with variations based on different signal and recording paths. There are ‘clean’ samples, versions printed to Studer tape at different levels of saturation, gritty E-mu SP1200 sets, and ‘mastered’ versions. All of these options can be changed per drum after a preset has been loaded. There are lots of other starting points, such as selected mixtures of different drum sources and more characterful kits. But the appeal of Revolution is the ability to assemble your own custom drum machine from bits of the classic boxes. The main Revolution instrument has a fixed layout of drum types, with each channel designated to one of six drum types: Kick, Snare, Tom, Hi-hat, Cymbal or Percussion. This limits you, for example, to only having two kicks and two snares per kit, but gives a consistency that is rather useful, especially for pattern compatibility. It’s also a practical consideration as the number of samples that would need to be loaded to allow complete flexibility would cripple Kontakt. The Percussion Kit starter preset does allow you to assign any Perc category module across any channel. 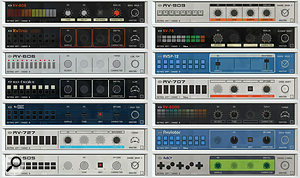 Revolution’s Modules. There are variations within each for drum type.The normal problem with sampling is that no matter how good your sound quality you’re only capturing a snapshot of an instrument in a single moment. So how you can recreate, say, an 808 kick when the original has Tone and Decay knobs? You could put two or three variations into the sampled kit; or a more sophisticated approach would be to sample at the maximum settings then use the sample player’s on-board envelopes and filters to try to emulate the original controls. However, this is only a rough approximation. Those 808 kick controls have their own specific characteristics, they interact, and there’s inherent analogue variation. Wave Alchemy’s solution to these problems is to sample the drum sources across a large range of different parameter settings, then recall the samples as needed based on the settings in Revolution. So as you adjust the Tone and Decay knobs on the RV808 kick module it feels like you’re smoothly adjusting the sound just like on the original. In fact your combination of settings is selecting from the array of possible samples. On top of this each sample was recorded multiple times, capturing the variations of the analogue circuitry even at the same settings, and these are played back in a round-robin fashion each time the sound is triggered. And on top of that, in the case of the 808 they did the whole thing twice using two different units that you can switch between. The results sound great. 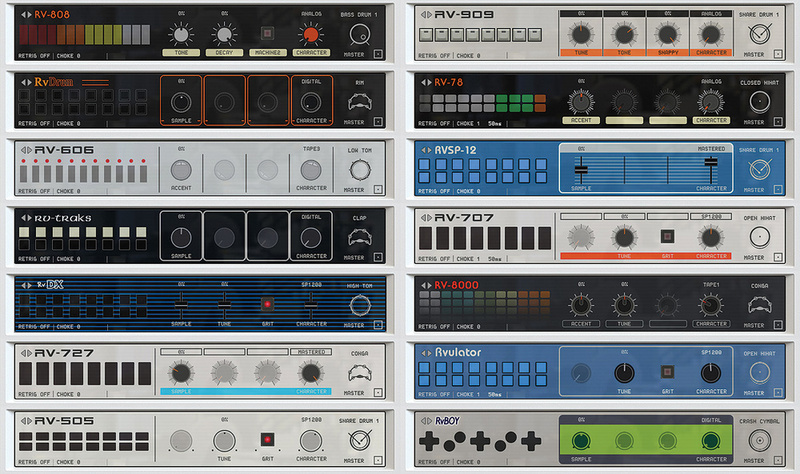 I spent a lot of time on listening tests comparing Revolution’s vanilla kits to several other libraries and these have the edge in terms of low-end solidity and natural smooth presence. As recreations these are the most convincing I’ve heard, but the various processed versions accessed from the Character knob can take you down other sonic avenues. Obviously these are fairly noisy sources, so you’d expect a little noise, but for the main Analog and Digital sets (with no processing) they’re remarkably clean, with no detectable quantisation noise in the fades. The Tape character option is, as you might expect, noticeably noisier than the other options. These samples have been left a lot longer than they probably need so their noise hangs around. The idea might have been to keep the noise running steadily like real tape while playing patterns, which kind of works, but the noise floor steps up and down depending on how many things are playing at once, and this is particularly noticeable when mixing Tape and non-Tape sounds in a kit. Although the drum modules can access the range of sounds possible on the original instruments, Revolution provides a suite of further sound-shaping modules and effects. The row of knobs below the main sound module gives per-sound envelope-modulated control of amplitude, filtering and pitch. For example, while the typical 808 snare sound used now is a short sharp crack, the original had no Decay control and has a relatively leisurely release. This can be tightened up by some tweaking of the Hold and Decay controls. Effects-wise, each channel has a Shaper, EQ and compressor, as does the master bus. There are also two separate delays and reverbs available on auxes, and Wave Alchemy have sweetened the pot with a large collection of reverb impulse responses to work with. 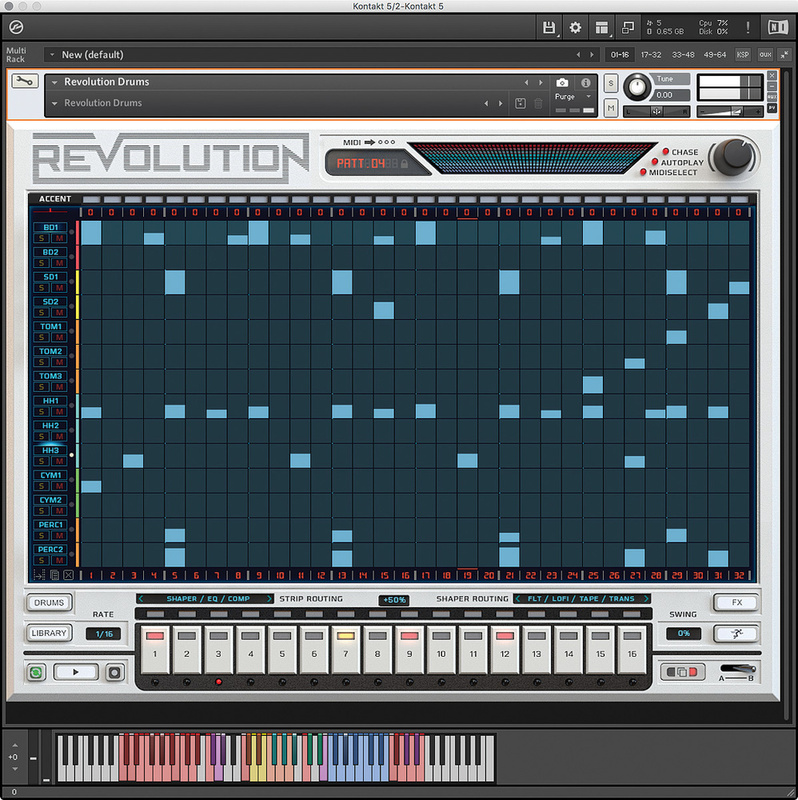 The Sequencer page, with the MIDI note map shown underneath.Revolution is a true drum machine instrument thanks to its on-board sequencer. This is accessed in two different ways. On the main Drums panel you have the gate buttons which follow the selected channel, offering a traditional hardware-like approach to programming. (An A/B switch toggles between two pages to access all 32 steps offered by the sequencer). Alternatively, you can switch the whole of Revolution’s panel into a 14-lane grid sequencer and work on your full multichannel pattern at once. The sequencer is a pleasure to work with. Velocity and gate are set with a single click, and you can click and drag through multiple steps. You can also right-click and draw ramps across multiple steps, or hold a modifier to randomise. You can add Shuffle or Swing, and each step has a ‘slop’ setting for other timing variation. Revolution’s parameter controls can be sequenced in a roundabout way if you assign velocity modulation to them; apparently there may be a future update that will add dedicated step automation lanes. If you like to program drums from a grid you’ll love all this, it’s one of the best implementations I’ve seen. But, I wondered, aren’t many people like me wedded to capturing drum patterns in real-time from MIDI? This was one of several moments with Revolution where I said ‘yeah but...’ only to discover that it could do the exact thing I wanted. 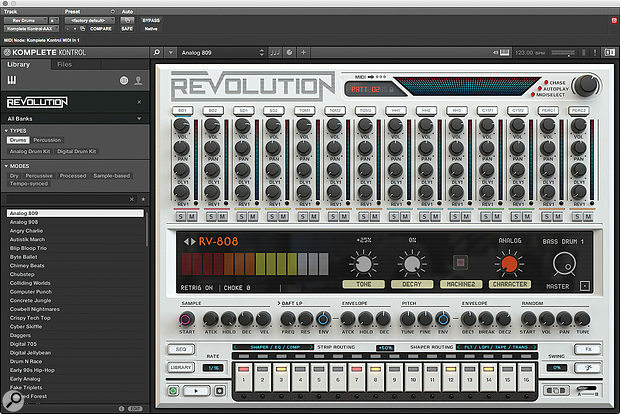 Revolution has extensive MIDI control, and you can absolutely record directly into the sequencer. Not only that, there are MIDI note assignments for punching into record, switching patterns, copying patterns between slots and many more. And a nice extra touch is that 16 keys are mapped to the X0X gate buttons, with another note for A/B toggle. These allow you to add/remove steps with velocity sensitivity. This MIDI map really comes alive if you have a Native Instruments keyboard with Light Guide. The main drum notes from C1 are colour-coded to match the plug-in. The two octaves below are the step sequencer triggers, with the Light Guide showing which gates are active, and animating the playback position. At the top end of the keyboard is a block of blue for recalling patterns, with a further set of red keys for controlling recording, duplicating and real-time erase. These keys spilled off the ends of my 49-key controller, so I suspect were designed on the 61- or 88-key versions, but I found I could leave the keys parked for either real-time recording or step sequencing modes. A great bonus is a couple of real-time variation triggers: one freezes the play position and repeats the current step, the other temporarily reverses playback. Both resume playback back in sync when released. All this meant I found myself essentially recreating my familiar Maschine, MPC or Live-style workflow directly in the Revolution NKS environment, pretty much agnostic of the host DAW. There are however other ways to integrate Revolution with your DAW’s built-in tools. For Live, Wave Alchemy provide a Group Patch that brings up Revolution with split routing inside a Drum Rack, allowing you to work with Push or other pad controller and Live’s own clip sequencing. With Maschine, Revolution comes up as an instrument rather than a Group, so can’t be treated like a drum kit. Maschine doesn’t really make it possible to use a single plug-in source in a kit in a satisfactory way. However, Wave Alchemy are planning an update that provides a single module version of the instrument with no sequencer. This will be perfect for bringing Revolution’s drum modules individually to multichannel pad instruments like Maschine and Push. 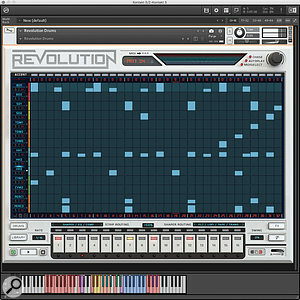 Revolution uses a kind of ‘brute force’ sampling approach to break down and capture every nuance of a host of classic drum machines, then re-assembles them with masterful programming of the Kontakt engine. Sonically it’s hard to fault, aside from the inevitable noise floor mismatches when mixing different modules and characters. The level of control makes these true instruments rather than sampled kits, and the sequencer is excellent. Initially I wondered if there was still much call for a stand-alone drum machine plug-in when many people now have standardised beat workflows within Maschine, Push and MPC. This is certainly worth thinking about if you work with these tools, but I actually found that Revolution brought my favourite aspects of these systems, namely fast capture and real-time pattern arrangement, to whatever DAW it’s running in, especially if you have an NI master keyboard. In any case, the upcoming single module version should give you the flexibility to work in your favourite environment. All in all, it’s very impressive. Built-in sequencer with real-time record/perform features. Noise variations when combining modules. All the legendary drum machines combined into one highly usable plug-in.